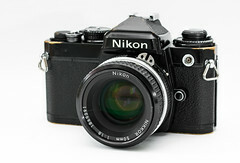 The Nikon FE is a 35mmm SLR manual focus camera introduced by Nikon in 1978. 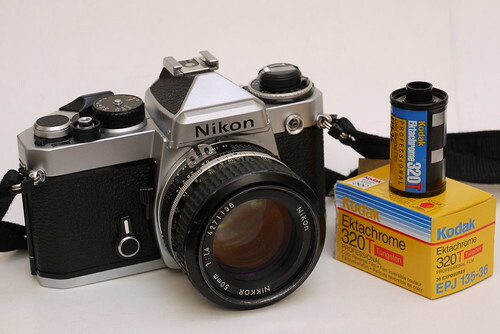 It was replaced with the Nikon FE2 in 1983. 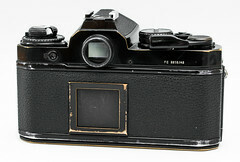 The FE has one of the largest ranges for lens compatibility. It can use just about every F-mount lens except a few old style fish eyes and G lens without the aperture ring. Works fine with VR lenses but VR is disabled. 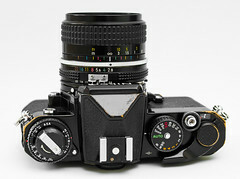 The replacement model FE2 cannot use the old style non-Ai lens but the original FE can with the use of stop down metering or manual exposure. The FE offers a shutter speed of 8 sec to 1/1000 with a max speed in automatic mode of 1/125 with electronic flash. Also provided is an aperture priority automatic exposure mode. AE lock is also provided but it is hidden on the self timer lever. Push toward the lens for AE lock function. Compatibility with optional motor drives MD-11 and MD-12. Recommended batteries are 2x 1.55v SR44 silver oxide or 1x 3v 2L44, but can still function with basic LR44. A battery check feature is also available.